Next i am planning to dress and shoe the two dolls whose faces i had done done as part of my first trial. One is going to my little grand niece Hanni, who was handling Gesa’s doll with so much awe that i realised she needed one for herself. And one is going to my little old lady who told me she would love one and then there are a few new arrivals who need cleaning. 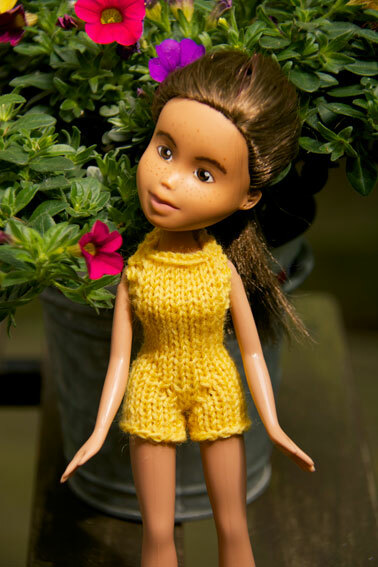 last night i knitted a bathing suit for the dolls, after a pattern from Sonia Singh’s mom. The yellow swimsuit is darling! Is that lace or sock yarn? Better you than me. I just got an order of yarn in pale colors and some whitewith flecks. The idea is to give my vision a break from darkish colors. When it came I was so pleased.. Without really having any colorways or theme in mind I ended up with mostly the colors of Hydrangeas and it's foliage. My favorite flowers as they always remind me of my Great Grandma. Ther is blue, pink, lavendar, greenish, and all shades of those colors, plus some tender greens. I can't wait to get started. that does sound beautiful! i love hydrangeas and have several in my garden. Those set into the soil have all turned bright pink but i have two blue ones in pots. i love the colours at all times; when they are about to fade, they get these amazing shades between blue, purple and green … and even the pink ones get blue when you dry the faded heads. the swimsuit is sock yarn. Yes, lighter colours are so much easier on the eyes, aren’t they? i didn’t think i would manage, to be honest, but it went okay. I am in SUCH awe of this project. When I shared the original lady's video on FB I was so in awe of what she had done to these dolls that I wouldn't have even dreamed of attempting something similar. I still think I would really struggle with the face but I love the idea of trying to make the little outfits. Such a beautiful, beautiful project. Bravo, seriously. I amazed. i think you would have no problem at all at doing the face, everything that goes wrong can be taken off again. i have seen so many brilliant project of yours, i am completely sure you would have no problems at all.